Enameling is the art of fusing glass onto metal under high heat conditions to create colorful designs. The earliest enamels were used as substitutes for precious gemstones in jewelry and ceremonial objects. Vitreous enamels are composed of glass and ceramic pigments, that used to produced colors. Depending on the composition of the glass, enamel can be transparent, opaque, or opalescent. Copper, silver, gold, iron and steel are the usual foundations to which enamels are applied. Look at the worm colors of copper, my favorite material, it's malleable, can easily be formed, and responds well to a wide range of enamels. And with transparent enamels you can see the copper - a glass and a base become one. 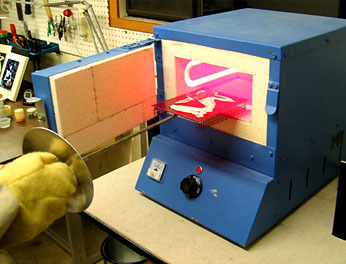 Through the years, a variety of enameling techniques has been developed from the coloring metal to embedded, encrusted and translucent glass forms. The process is quite complex, and knowledge, skill and experience are necessary to apply enamel to metal. 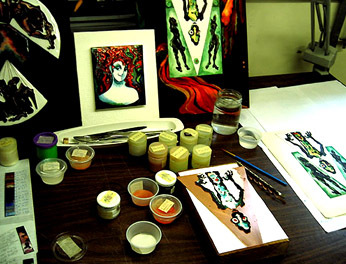 The cloisonné enameling technique helps me to express the slices of reality that can be perceived and sparkles of human being we always trying to overtake. Cloisonné is a French word meaning "to be cut off". It describes a technique that embedded or encrusted enamel. The design is formed by narrow strips of thin metal ribbons of wire to separate areas of enamel color. Various colors of transparent, opaque, or opalescent enamels can then be inlayed around the wires and fired in layers in a kiln at 1475° F.
Three styles of cloisonné are most often seen: concave, convex, and flat. The finishing method determines this final appearance. I am working with concave cloisonné when the cloisonné cells are not completely filled. Capillary action causes the enamel surface to curve up against the cloisonné wire when the enamel is molten, producing a concave appearance. This effect helps to illuminate the outline and bring glass sparkles and shadows to my enamel art pieces. I do like to work with metal and glass. It can be colored, melted, fired, polished, chased, etched, annealed and patinated. What better medium could we find for objects, which try to bring eternal values to our understanding... or to preserve a smile over the ages? Browse my gallery to view the enamel art.